The humble overhead projector becomes a tool for movie-like magic in the hands of the performance collective Manual Cinema. 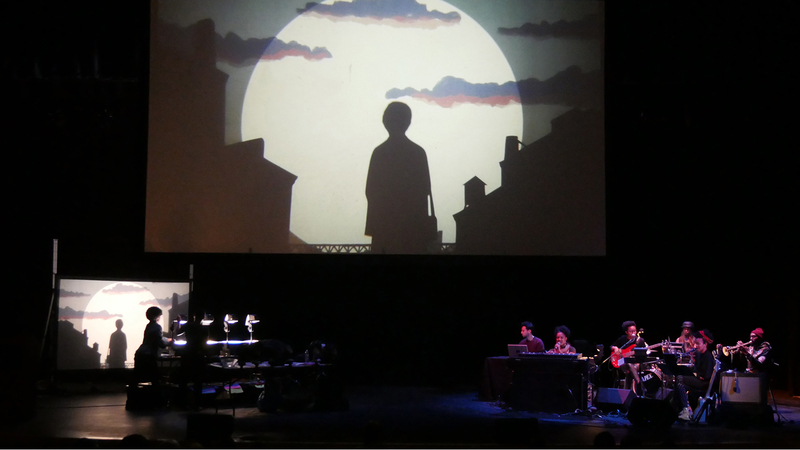 Using handmade shadow puppets, immersive audio, live video feeds, and a lot of ingenuity, this award-winning troupe breathes life and dimension into their imaginative productions. No Blue Memories—The Life of Gwendolyn Brooks tells the story of one of Chicago’s most beloved figures. Brooks was a civil rights icon, an Illinois poet laureate, and the first African-American Pulitzer Prize winner as well as a treasured educator and mentor. Her legacy lives on at the University of Illinois, where her papers are held at the Rare Book and Manuscript Library. In Manual Cinema’s contemporary, theatrical rendering, scripted by Eve L. Ewing and Nate Marshall and commissioned by the Poetry Foundation, striking visuals combine with poetry, storytelling, and original, live music by Jamila Woods and Ayanna Woods for an inspiring tale of identity, politics, and one of the most remarkable American literary careers. Join us at the Rare Book & Manuscript Library at 4pm on Wednesday, November 28 for a behind-the-scenes lecture and reception with the actors from Manual Cinema: No Blue Memories—The Life of Gwendolyn Brooks. For more information, visit the event page.